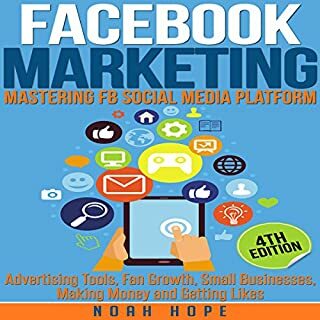 In this expanded fourth edition of Facebook Marketing: Mastering FB Social Media Platform, you'll be taken through a step-by-step process on how to develop your web presence. You will understand how Facebook marketing is shaping business today - and why it is so effective. You’ll find out why it’s essential to use Facebook to promote your company - and to build an online community! It was alright, full of good common sense advice but I was hoping for something more technical. Example :there was only ONE page on dynamic retargeting , I would've loved to read either more about it or similar techniques with examples and actionables.. All in all, the book is good to get a general idea of Facebook Marketing.